If someone is experiencing the symptoms of a heart attack, be sure to take the appropriate steps to mitigate the effects of blood loss to the brain. Have the person take an aspirin as long as he or she is not allergic and are conscious to do so. 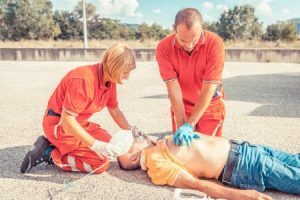 If the person stops breathing, you or someone else who is qualified should perform CPR.o If you don’t know CPR, the 911 operator can assist you until the EMS personnel arrive.